A talent-rich nine race card has been confirmed for 2016 Coolmore Classic Day at Rosehill Gardens Racecourse; highlighted by seven black type races including the feature for fillies and mares, contested over 1500m. It is a fine day in the greater Sydney metropolitan region today and the Rosehill track has been rated a Good 3 following only 16mm of irrigation through the last seven days. The action on 2016 Coolmore Classic Day is set to get underway with the running of the Group 3 Sky High Stakes (2000m) at 12:20pm local and will concluded with the TAB More Than Just Winning Handicap (1350m) at 5:30pm. Only six stayers will line up for the Sky High Stakes following the scratching of 2015 winner Hartnell and Pemberley. Races 2 and 3; the Group 2 Pago Pago Stakes (1200m) and Group 2 Magic Night Stakes (1200m) with figure as the final points of call for a number of two-year-olds set for next weekend’s 2016 Golden Slipper. A number of notable sprinters have been confirmed in a final field of ten for the Group 3 Maurice McCarten Stakes (1100m) at 2:50pm while some of the Autumn Carnival’s most exciting three-year-olds will contest the Group 2 Phar Lap Stakes (1500m); a race claimed by Winx in 2015. 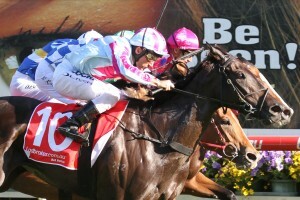 The featured Group 1 Coolmore Classic (1500m) is set to be one of the most exciting editions of the race. The likes of Lucia Valentina, Politeness and Solicit have all been confirmed to take their place alongside in-form mare Azkadellia, while three-year-old Ghisoni is sure to lay a great account for herself with only 50kgs in tow. Race 8; the Group 2 Ajax Stakes (1500m) figures as Coolmore Classic Day’s final black type race and will feature twelve middle distance starts including Good Project, Generalife and Rock Sturdy. Leading online bookie Ladbrokes.com.au is currently offering the best odds on all nine races on 2016 Coolmore Classic Day!